As an international company with global supply chains, we are aware of our responsibility to respect human rights. The ALDI SOUTH Group is certain that long-term business success can only be ensured if human rights are acknowledged and respected, protected and fulfilled. We believe that companies should be committed to respecting human rights and preventing human rights violations. Our commitment therefore encompasses our own business operations and our business relationships, as well as those indirectly caused by our actions. The ALDI SOUTH Group’s human rights due diligence approach is outlined in the diagram on the left. Further information regarding our approach can be found under the links below. The ALDI SOUTH Group respects all internationally recognised human rights. There are certain human rights aspects that are of increased relevance to us as a food retailer and vendor of non-food as our actions could have a stronger impact on these. These include discrimination, health and safety, freedom of association, remuneration, working hours, child labour and forced labour. We review our human rights impact, in particular our areas of focus, in cooperation with external experts. Our Human Rights Policy statement outlines our commitment and processes to respect human rights across our business. We have already completed the first step by carrying out a risk assessment to identify actual and potential human rights impacts with an external expert. The next steps will be to integrate and act upon the findings via our responsible sourcing strategy and track progress, communicating through external reporting. We are certain that long-term business success can only be ensured if human rights are respected. We believe that human rights cannot be realised by any one company or organisation acting in isolation, however we understand that our actions may directly or indirectly have adverse impacts on workers in our supply chains. We have an important role to play in raising awareness of human rights issues and working collaboratively with our suppliers and other external parties, such as governments and trade unions, to prevent or mitigate the adverse impact of our business. We recognise that human rights violations are systemic and a global problem affecting every economy, industry and sector. Our approach is based upon understanding the complexities of the issues and continually improving the processes we have in place to prevent human rights abuses from occurring. We understand that weak, or lack of, existing legislation and lack of compliance and minimum standards in some countries are not conducive to achieving acceptable labour standards, for example for forced or child labour, which is why we adopt more stringent standards to mitigate the specific risks of human rights abuses to workers in some sourcing countries, such as Bangladesh and Myanmar. We understand our responsibility to address human rights as a process of continuous improvement. Over the next 5 years, we intend to evaluate and develop an approach to fulfil these commitments via a number of measures to complement our existing activities and address our high-priority raw materials and commodity groups in food and non-food supply chains, identified via a human rights risk assessment. Such measures include: review of policies and processes to address compliance with human rights standards and principles, formulation of minimum standards for production conformant with human rights, traceability and supply chain mapping, social auditing and certification, integration of CR into the buying process, participation in multi-stakeholder initiatives, capacity building and projects on the ground. Together with our buying teams, we will develop goals and KPIs to allow us to monitor progress and identify where further action is needed. Our ongoing and future reporting will demonstrate how we fulfil our due diligence in line with the United Nations Guiding Principles (UNGP) framework. We understand that our commitment to respect human rights needs to be reflected in our purchasing practices. As the majority of our products are not sourced directly from producers, rather from suppliers who commission the manufacture or import of the products, collaborating with our suppliers is an essential factor in achieving our sustainability goals. Our approach is to work together with our suppliers to resolve issues or problems and to drive continuous improvement along our entire supply chains. We understand that, due to the complexity and sensitivity of human rights issues, they may take time to resolve and it is not our approach to cease business with suppliers upon identification of such issues. If risks or problems arise, the type of follow-up action implemented will depend on severity of the issue and the willingness of the supplier to enact or assist with prevention, mitigation or remediation. We commit to maintain dialogue with our suppliers, working together to share the responsibility to respect human rights in our supply chains. We will continue to adjust our buying practices to address adverse impacts on human rights. These are already considered during our buying tender process and we actively intensify collaboration with suppliers who have demonstrated a good CR performance as part of our social monitoring programme. Suppliers of high-priority product groups will be integrated into our social monitoring programme over the next 5 years. We are aware of the fact that our actions and those of our business partners can have a potentially adverse impact on human rights throughout our supply chain. In line with our obligation under the UN Guiding Principles on Business and Human Rights, we seek to prevent or mitigate adverse human rights impacts directly linked to our operations, products or services and we continuously carry out human rights due diligence to identify human rights-related risks, for example, ongoing research and hot spot analyses. In addition, we also consult with external experts, for example, within the scope of an extensive stakeholder survey, and consider their assessment for all of our actions. We gain regular insights into the working conditions at production facilities used for making our non-food products in risk countries through certification, comprehensive social audits conducted by external service providers, our own production facility assessments - ALDI Social Assessments (ASAs) - performed locally by our expert staff, as well as direct dialogue with suppliers. Furthermore, we are increasing the frequency at which we undertake business trips to the countries of production and origins of our merchandise to gain a clearer picture of conditions on the ground. On site, we engage in dialogue with stakeholders and individuals who are potentially affected in order to improve the identification and early prevention of instances where human rights are not respected. Furthermore, as a food retailer, we place a particular focus on the identification of human rights-related risks in food products. Alongside other measures, we are increasing the number of social audits and visits conducted for our food product supply chains either by our own employees or with the assistance of external third parties. Together with an independent service provider specialising in sustainability issues, we have now also comprehensively examined the human rights risks which are present throughout our supply chains for food products. 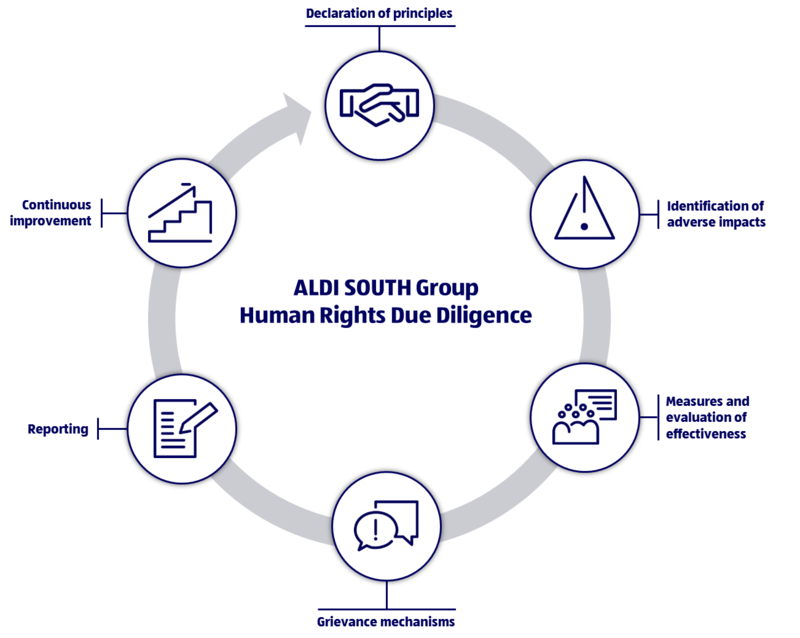 The aim of this assessment was to identify human rights risks and our greatest level of influence throughout the global supply chains of the entire ALDI SOUTH Group. The scope of this assessment includes the entire supply chain with a special focus on the sourcing of raw materials and final assembly processes. We understand that the greatest risks lie at the raw material stage but our greatest influence is often at final assembly stage. The assessment was based on internal data, such as buying volumes and the locations of producers and production facilities, as well as global industry data. In addition to this, several existing recognised indicators and analyses were included such as the Global Slavery Index, the Environmental Performance Index, and the Corruption Perception Index by Transparency International. 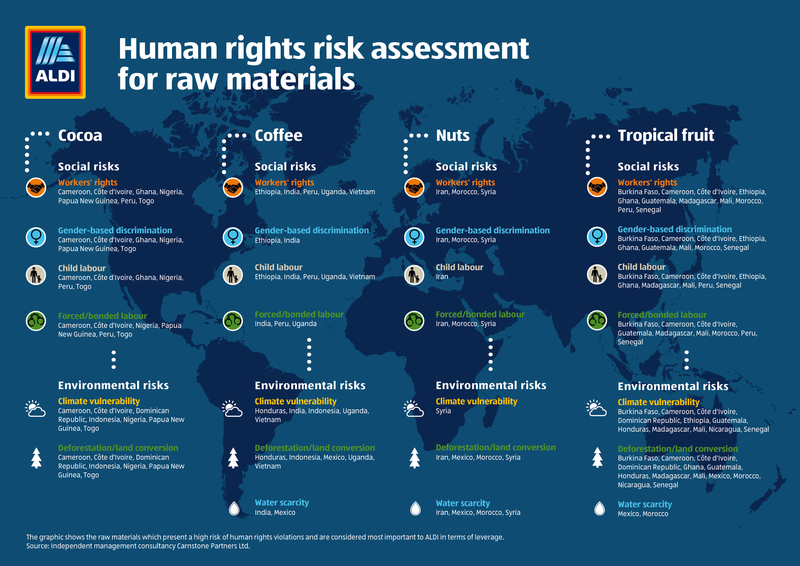 In addition to social risks, the assessment covered environmental risks (for example climate vulnerability, water scarcity, and industrial pollution) throughout the supply chain, as these also have an indirect impact on human rights. An overall risk assessment was undertaken for every country of origin or production from which we source our products. Workers' rights: the risk that workers' rights could be violated, for example, by exceeding the permissible working hours, low wages, health and safety risks, workplace bullying, harassment and abuse, discrimination or restricted freedom of association. Gender-based discrimination: assessment of unequal treatment between men and women (including specific challenges faced by women) and the risk of possible gender-specific discrimination, for example, through gender-based abuse or discrimination with regard to wages and working conditions. Child labour: the risk that children undertake work that has an adverse impact on their health and development and the risk of work by children of mandatory school age. Forced/bonded labour: refers to modern forms of slavery and human trafficking, for example, by exerting pressure, withholding wages, or other forms of coercion. Water scarcity: the risk that a country's demand for water exceeds its availability. This is accompanied by limited access to a water supply - for personal consumption and/or as a source of income. Climate vulnerability: assessment of the current and future risk that a certain country is exposed to extreme weather events. In addition, the willingness of the private and public sectors to invest in the necessary modifications was also assessed (for example in the case of drought, flood or hurricane). Deforestation/land conversion: the likelihood that products are cultivated on land which was recently a forest area with high conservation value, which may mean that forests were destroyed and land rights violated. Industrial pollution: pollution caused by the manufacturing of products, which then leads to air and water contamination, (chemical) waste and noise pollution. To address the most salient human rights issues identified following our human rights risk assessment in the countries of origin most relevant for ALDI SOUTH, we will develop specific measures to prevent or mitigate adverse human rights impacts. By 2020, we plan to carry out detailed human rights impact assessments for three high priority raw materials to understand the impact of our operations on workers and other affected rights-holders, including a particular focus on the impacts for smallholder farmers and women. We will publish the results of the impact assessments once they have been carried out. The assessments will be carried out alongside experienced local partners and will include dialogue with relevant stakeholders, particularly workers. As per our responsible sourcing strategy, we will use or seek leverage to mitigate the adverse impact of our business activity on human rights. We consider third party social audits to be an important first step in gathering social compliance information about our production sites and initiating improvement but we are aware that they may not always provide a true picture of working conditions and may fail to identify hidden issues such as forced labour, discrimination or harassment. We therefore commit to adopt an approach to ethical trade that goes beyond compliance and does not rely solely on social audits, complementing our audit approach with additional activity such as our own on-site visits, supplier and producer communication and training, participation in multi-stakeholder initiatives, capacity building and projects on the ground. Introducing permanent improvements to working conditions requires a collaborative approach to ethical trade between ALDI and our suppliers. An example of where we have successfully adopted a collaborative approach is our ALDI Factory Advancement (AFA) project in Bangladesh. More information can be found here. We also believe that a collaborative approach, for example with other companies, trade unions and national authorities, is needed to approach sector-wide challenges and achieve sustainable improvements. We offer our customers a wide variety of different products, both through our core range and weekly range of special buy items. Throughout our global supply chains, we assume responsibility for promoting fair working conditions and environmental compliance. We work with many different types of suppliers from small, family-run businesses to larger global companies, depending on the product type. We recognise the importance of smallholder, or small-scale, farmers to our business, particularly for fresh produce, and we are proud to support them. We understand that there are numerous specific challenges faced by smallholder farmers, who are predominately women. Due to many factors beyond farmers’ control such as climate change, unpredictable weather conditions, international energy prices affecting farm inputs such as fertilisers, land rights, labour shortages due to migration into cities, and lack of access to market, it can be a challenge to produce a stable quantity of crops. Economic globalisation and fluctuating international market prices also greatly affect smallholder farmers and can have a direct impact on farmers’ abilities to feed themselves and their families. Farmers often are not able to earn a living income and they are often also disadvantaged by lack of collective bargaining agreements in their countries of production. Such issues cannot be tackled by any single entity and it is paramount that companies work together with expert stakeholders and local governments to ensure smallholder farmers can earn an income that ensures an existence worthy of human dignity as defined in the International Bill of Human Rights, and be resilient to the challenges they face. We recognise that we also have an important role to play in facilitating this. Through increased numbers of on-the-ground visits and projects with local partners, we plan to work together with smallholders to help them address salient issues, for example investing in soil health to improve quality and consistency of harvests, education on nutrition and managing finances, helping farmers to invest in order to mitigate risks. We are currently involved in a number of projects and initiatives which help smallholder farmers and, following our human rights impact assessments, we plan to increase dialogue with and support to smallholder farmers for our high priority raw materials. To produce and supply the wide range of products sold every day at ALDI, we rely on the skills of a large, diverse and global workforce. At ALDI, we believe that all workers should be treated fairly, regardless of origin, religion, ideology, age, gender, physical ability, or sexual orientation. We do not tolerate any form of discrimination, as outlined in our ALDI Social Standards in Production which is based on, among other standards, the UN Convention on the Elimination of All Forms of Discrimination against Women. We recognise that the majority of workers in many of our agricultural and textiles supply chains are female and that they may be disproportionately impacted by adverse human rights impacts for a number of complex reasons, some of which are country- or sector-specific. As per our recent human rights risk assessment, some of the problems faced by female workers include unequal treatment, risk of gender-specific discrimination regarding wages and working conditions, disproportionate share of unpaid or ‘invisible’ labour, work at a lower hierarchy level and with low remuneration, separation from children and limited access to land, education and/or personal bank accounts. We acknowledge our responsibility to fulfil the UN Sustainable Development Goal (SDGs) number 5 to achieve gender equality and empower all women and girls across our own business and supply chains. 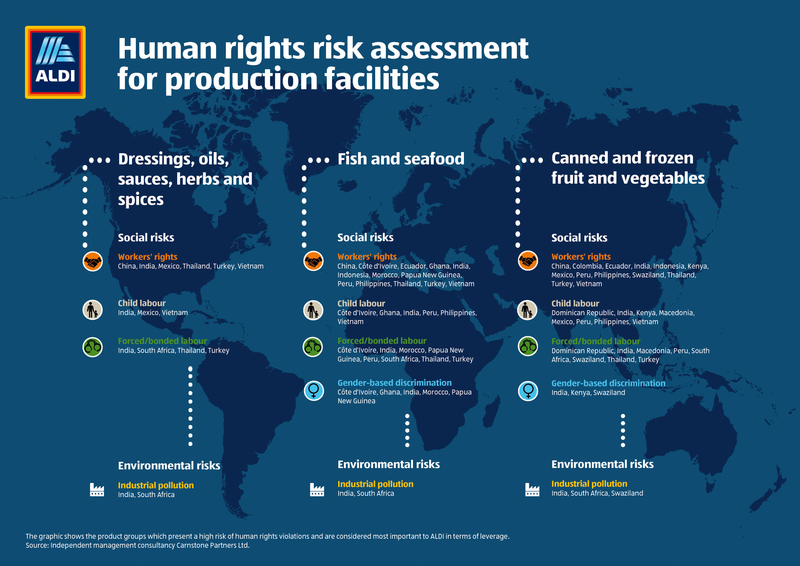 Identifying raw materials and products with a high risk of gender-based discrimination was a key part of our human rights risk assessment in food supply chains and an important first step to understand where to place our focus. As a next step, our human rights impact assessments will also seek to understand the impact of our operations on workers, including a review of the root causes of issues and related impacts for women. In our textiles supply chains, we have identified that many workers are reliant on factory-based childcare services due to financial constraints and a lack of alternative care options. As these services are often of poor quality, many working women leave their children behind in their communities. Through our ALDI Factory Advancement Project (AFA) Project PLUS, we support production facilities in Bangladesh towards improving their internal childcare offers to enable working women to pursue a career and improve their economic situation. Within the scope of the project, employees and nurses working at production facility day-care centres receive professional training and production facilities are assisted in improving the equipment of their day-care centres and establishing corresponding processes and structures. Further information on the project can be found here. The ALDI SOUTH Group joined the World Banana Forum (WBF) in October 2017. The WBF is a multi-stakeholder initiative committed to fair working conditions and sustainable environmental standards in banana production. Cocoa is one of the most important natural resources used for our products. Within the scope of our membership of the German Initiative on Sustainable Cocoa (‘Forum nachhaltiger Kakao’), we aim to contribute to improving the working, environmental, and social standards in the cocoa sector. Along with the German Initiative on Sustainable Cocoa and government of Côte d’Ivoire, ALDI SOUTH Germany has since 2015 participated in the PRO PLANTEURS project to support approximately 20,000 cocoa farmers, including women farmers and their families, to achieve the sustainable cultivation of cocoa and improve the living conditions of cocoa farmers. More information can be found on ALDI SOUTH Germany’s website here. In order to improve the situation of coffee farmers worldwide, we highly value sustainability certification. ALDI SOUTH Germany, together with TransFair e.V. supports 13 Fairtrade coffee cooperatives in Honduras. They receive assistance in improving the quality and quantity of their coffee harvests and learn how to optimise the sale of their products. This project also facilitates the farmers’ access to credits, improves the involvement of women and young people in society and the economy, and supports the implementation of environmental measures in the coffee-growing sector. More information can be found on ALDI SOUTH Germany’s website here. We have set ourselves the goal of continuously increasing the share of certified ALDI SOUTH products which contain fish and seafood that are either wild-caught or farm-raised, and avoiding the use of controversial fishing methods. We aim to work towards achieving this goal by carefully selecting sustainable products for our product range. ALDI SOUTH Germany has supported a prawn project in India (West Bengal) and Costa Rica (Terraba-Sierpe national park) since 2017 alongside Ristic GmbH (part of the Shore Group). The aim of the project is to protect mangroves and create sources of income for local farmers. In addition, we help the local population to free up additional sources of income, such as mangrove honey, mussels, and prawns, as well as offshore fishing. More information can be found on the Pure Shrimp Initiative Website here. In 2017, ALDI US became an active member of the Seafood Task Force, a multi-stakeholder initiative seeking to address illegal, unreported and unregulated (IUU) fishing, to support the effort of resolving human rights issues and marine conservational problems in the Thai shrimp industry. The aim is to achieve more responsible seafood supply chains from vessel to retailer through driving oversight and continuous improvement across people, product, process and policy. The Seafood Task Force uses the combined knowledge and experience of its membership to address complex supply chain issues that cannot be solved individually. Members of the Seafood Task Force are required to work in a sub-group based on their skills and experience. Sub-Groups are tasked with a specific brief and are accountable to the Board for the delivery of specific, measurable and timely goals. As part of an effort to develop a Mutual Recognition Programme, ALDI US has been collaborating with Sub-Group 1 members to develop a matrixed and phased approach for land-based supply chains (e.g. fishmeal plants, feed mills, hatcheries, farms, or processors) with the goal to support robust social compliance schemes that drive positive change and address social compliance issues as well as reduce audit fatigue and cost in the supply chain. More information can be found on ALDI US’s website here. Since March 2019, ALDI GB has funded a project with the Fairtrade Foundation aimed at empowering women flower farm workers in Ethiopia. Following the Fairtrade Foundation’s She Deserves campaign to increase women farmers and workers’ incomes, the four-year programme aims to build on Fairtrade’s impact and will benefit more than 11,000 flower farm workers. It will deliver training in seven flower farms in subjects such as workers’ rights and gender equality, and offer strengthened support for gender committees and work with trade unions to advocate for fairer wages and improved structures to empower women on Fairtrade certified farms. The aim of the project is to both empower and protect women, and give them the tools and support they need to take on leadership roles on farms in their communities. The funding will benefit the Fairtrade certified Herburg Flowers, where 75% of ALDI GB roses are sourced. The four-year programme will build on and complement the achievements made from sales of Fairtrade flowers, and is being delivered by Fairtrade Africa, Fairtrade Finland, the Fairtrade Foundation and the Ethiopian Horticulture Producer Exporters Association, with funding from the Ministry for Foreign Affairs of Finland, The Swedish Post code Lottery and ALDI GB. More information can be found on the Fairtrade Foundation’s website here. In 2016, ALDI GB became the first UK supermarket to team up with international development charity Farm Africa in a three-year partnership to support young farmers in Kenya. To date, ALDI has donated £260,000 to fund the Growing Futures project to educate and improve the lives of more than 400 young people in Kitale, Western Kenya. The project trains young people how to grow high-quality crops, like green beans, tomatoes and kale, as well as how to run their farms as businesses. The result is higher yields and higher profits. As well as assisting young farmers to vastly improve the quality and amount of food they produce, the project will help ensure they are growing the most valuable crops, support them in finding the best contracts, and enable them to sell their crops at higher value markets so they can find a lasting way out of poverty. More about the project is available here. A significant share of globally traded palm oil/palm kernel oil is produced by smallholders. In order to account for these smallholders within the scope of ALDI’s commitment to using sustainable palm oil/palm kernel oil, we employ a combination of three measures: purchasing RSPO Independent Smallholder Credits to support their work, participation in the RSPO Smallholder Working Group in order to further support and integrate smallholders, and since 2017, support for a smallholder project in Côte d'Ivoire in order to pave the way for a sustainable cultivation of palm (kernel) oil. In the scope of this project, ALDI works together with the network organisation Solidaridad who has established a roundtable within the palm oil sector that promotes incentives for smallholders concerning the protection of high conservation value forest. The project uses the ‘train the trainer’ method and participants are encouraged and enabled to share their knowledge with each other. Furthermore, the project is based on the engagement with local stakeholders (such as producer groups, local communities). Solidaridad and their consultants support local communities by, for example, selecting suitable trees which are grown in tree nurseries and will be planted in cooperation with local communities. In addition, the ALDI SOUTH Group is an active member of the Retailer Palm Oil Group (RPOG), and the Palm Oil Transparency Coalition (POTC) and has been actively involved in the Smallholder Working Group (SHWG). In addition, we are a member of the Smallholder Standing Committee (SHSC) and represented in the RSPO Board of Governors by the RPOG, which has a seat on this board. We see the risk assessment as a starting point for identifying major human rights risks throughout our supply chain and for determining the relevant areas of focus for our continued work. As a next step, we will focus on the raw materials determined by the analysis to be of highest risk - coffee, cocoa, nuts, and tropical fruit, especially bananas - in the countries of origin which are most relevant for ALDI SOUTH. Subsequently, we will develop specific measures for reducing these risks. In future, we will significantly increase our commitment and efforts within the additional identified areas of risk within the scope of our international Responsible Sourcing Strategy, in addition to the current measures taken to prevent or mitigate adverse human rights impacts. ALDI GB and Ireland is a Founding Sponsor of the Responsible Recruitment Toolkit to offer support and resources to suppliers to embed responsible recruitment practices in their supply chains. We will continue to publish regular information on the progress of our commitment to respecting and upholding human rights.